Hello, lovelies~ No, this isn't the zombie movie that was released years ago. 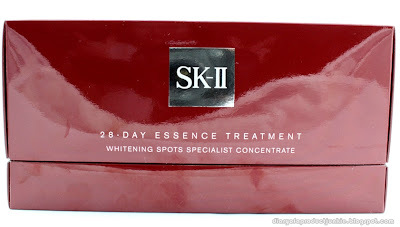 This post is going to be a review on the SK-II 28-Day Essence Treatment Whitening Spots Specialist Concentrate. Quite a mouthful, isn't it? 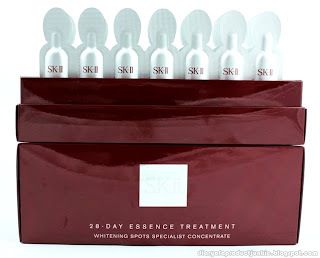 I received this product a month ago at the SK-II launch event that you can read about here. The set comes in a red box with an inscription of how to use the product. The product itself is packaged in 28 individual foil ampule to ensure the quality and freshness of the product. I really like the packaging because it is sealed tightly in that foil packaging so that I can take it with me if I were to travel. Also, the essence will be in tip top condition due to the limitation of air and light exposure. 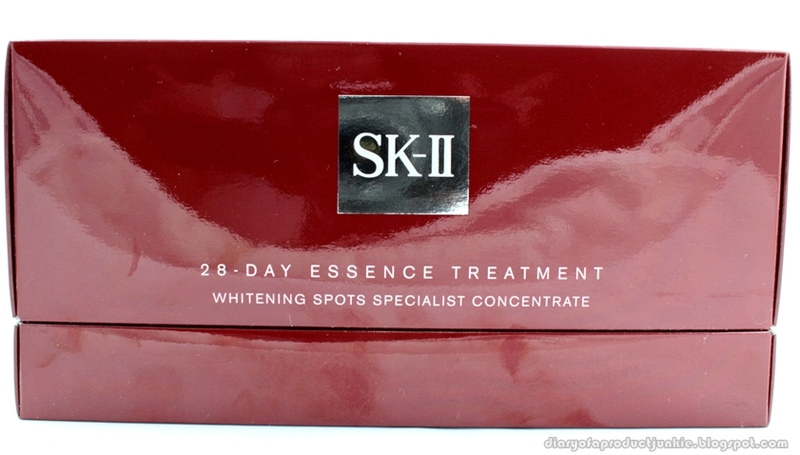 The essence contain Galactomyces Ferment Filtrate, which is the signature ingredient of most SK-II products. This ingredient is second place on the ingredients list, which is good because the higher up the ingredient, the larger the amount that is contained inside. 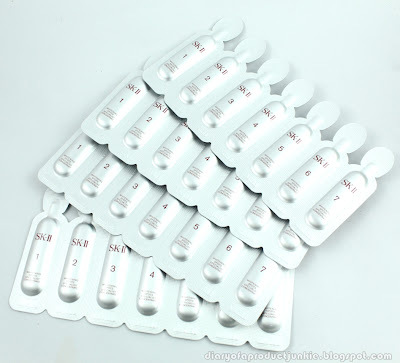 It also contains Niacinamide which is a cell-communication ingredient which will help restore the skin's cell structure. For humectant, this essence has Glycerin, which helps attract moisture to the skin from the surrounding environment. This will result in a plumper and more moisturized skin. The texture of the essence is a slightly thick, semi white liquid. It has a slight scent, probably from the Galactomyces ferment, but it fades as I applied it on my face. The first few seconds when applied to the face will feel sticky, but as I started to blend all over the face, the stickiness disappears. My face feels instantly soft and smooth after applying this. It is recommended to use the whole ampule once it is opened to guarantee the freshness and quality of the essence. I would pour this on the back of my hand, dot this evenly all over my face and neck, and blend all over my face evenly. Afterwards, I would pat my face gently and press my palms on my face to make certain that the essence is absorbed into the skin. After 28 days of using this essence, my face looks brighter, smoother and softer. I didn't have any break out sessions while trying this essence for 28 days. I can't explain how the galactomyces helped in achieveing softer and plumper skin, but it does. The price IS quite a bit expensive, but skin care is some kind of an investment, I believe. Jam packed with all the necessary ingredients for a plumper and younger looking skin, I would see this as a good investment. So, to sum up, I think I'm going to start saving up for a better looking skin. What about you?